In-service cleaning – the general principle is to inject a solution of Unitor™ Air Cooler Cleaner™ into the air trunking upstream of the charge air cooler, followed by a clean water rinse. For efficient cleaning of air coolers, it is necessary to use correctly installed dosing and injection equipment. 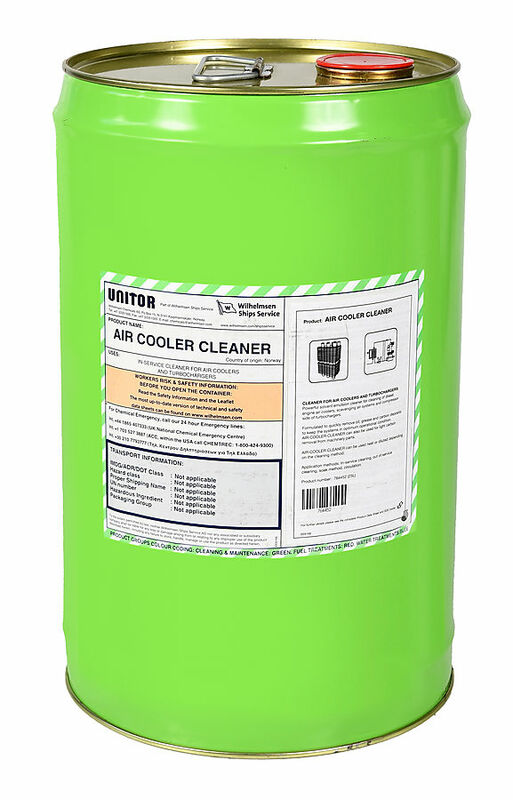 For in-service cleaning of the air cooler and air-side of turbochargers, a solution of 25% Unitor™ Air Cooler Cleaner™ in freshwater is recommended. The appropriate dose of cleaner is then put in the dosing pot and injected up-stream of the air cooler in 10 minutes. After a further 10 minutes, a similar quantity of fresh water is injected to rinse off the emulsified deposits. Rate and frequency of application depends mainly on the condition of the air coolers. However, when starting with the use of Unitor™ Air Cooler Cleaner™, we recommend injection every 24 hours. After initial cleaning period, the cleaning effect should last for 48 hours of operational time. Although frequency of cleaning may vary, the calculated cleaning dose should remain the same. This cleaning method is only recommended if approved by engine manufacturers. Handspray Cleaning – in this situation the engine must be stopped. Open an appropriate air trunking inspection cover. Open air cooler drain valves. Using a pressure handspray, apply undiluted Unitor™ Air Cooler Cleaner™ all over the cooler coils. Allow the Unitor™ Air Cooler Cleaner™ to penetrate the deposits for a minimum of 1 hour, then use a high pressure lance or water jet to wash off the loosened deposits. After satisfactory cleaning, and flushing through with fresh water, close air cooler drains. Soak Method – this method may be used for machine parts with stubborn carbon deposits. Put parts to be cleaned into a bath of undiluted Unitor™ Air Cooler Cleaner™ and allow deposits to be broken down and loosened before removal, then rinse. The engine manufacturer should be consulted before installing injectors. Large engines will normally require two injectors per cooler, but one injector is usually sufficient for medium and small engines.